The charm of Yesudas’ voice is easier felt than described. It gushes straight out of his heart, flows gently like a stream gaining lustre on its path, leaving no aspects untouched and missing no beauty along its way in all three octaves. The more you hear him, the more you love him. Even 44 years after he made his entry into the world of film music, Kattassery Joseph Yesudas continues to woo millions of music lovers all over the country, and in particular the Malayalees, with a golden voice that has survived the test of time. And this popular singer, slated to perform for the first time in Chandigarh this evening, has the music lovers in the region eagerly awaiting his concert. Vocal quality and style, musical interpretation and achievement, in short, everything to do with popular music in Malayalam has been so dominated and coloured by Yesudas that music aficionados can conceive of no other singer in the same mould. Yesudas was ushered into the Hindi film music world in 1975 by Salil Choudhury, a loyal admirer of the southern singer’s velvety voice. The film was ‘Choti Si Baat’ and the song Janeman Janeman Tere Do Nayan, a duet with Asha Bhosle. True, the Malayalees flirt with new singers; but almost always the affairs have been shortlived. After yielding to curiosity and tasting something that is a little different, they return to Yesudas like a homing pigeon. "For me music is God," says the 65-year-old disciple of Chembai Vaidyanatha Bhagavathar, who balances classical and film music with an enviable ease few singers can manage. "There were times in my life when I went to bed on an empty stomach. My father, Augustine Joseph, was an accomplished singer, but he was never able to make a fortune out of music. We were lucky to inherit his passion for music. And that was much more precious than all the money in the world put together." Yesu was born on January 10, 1940, in Fort Kochi. He started accompanying his father Augustine Jospeh to his concerts from an early age. His first film song featured in Kalppadukal (1961). Yesu prefered to wear white always. His reason: "I had only a single pair of dress during my school days. It was a white shirt and shorts. I wanted to make other children believe that I had more of such shirts and shorts." Yesduas with his wife Prabha and son Vinod at the Mookambika temple. What lingers on his face during concerts is a sense of inner peace and timeless faith lining his gentleness. "Music, for me, is meant for soothing troubled souls. I feel content if my music, whether it is classical or light, brings peace to the listenermind in this tension-ridden society." For Yesudas, the journey to the top was no cakewalk. It was a tough roller-coaster ride, an emotional one at that, with its share of ups and downs. It all started from a tiny recording room in Chennai’s Bharani Studio in November, 1961. "I still remember the lean, dark youth who came in with K S Antony, the director of Kalppadukal," recalls K P Udayabhanu, a veteran singer who reigned on the playback scene in Malayalam until the emergence of Yesudas. "The composer, M B Sreenivasan, introduced him to me as the singer son of Augustine Joseph. Yesu was asked to render these immortal lines of Sree Narayana Guru: Jaatibhedam mathadwesham`85. Listening to the mellifluous voice, we were transported to another world. Visibly moved, MBS offered him another full song, a duet." 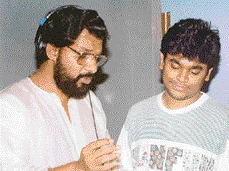 Kodeeshwara Rao, the veteran sound engineer, okayed the songs after the first take itself, and the legend of Yesudas was born. The rest, as they say, is history. Nearly 25,000 songs and seven national awards later, Yesudas — a recipient of the Padma Bhushan — remains a point of reference, a standard of achievement, an inspiration and a daunting exemplar of musical accomplishment. During the past four decades, producers and directors have come and gone, actors and actresses, stars big and small have lit up the skies and vanished into the mists of time. These years have seen major changes in film technique, style, fashion and perception. Through all these years, Yesudas has stood unobstrusively like a backdrop, both as a participant and a silent witness to 40 years of cultural history. All this while his popularity and magic have remained unaffected. Age might have caught up with the man, but not with his passion for creativity. Remember Ahimsa, the East-West fusion album he brought out in association with Latin American composer Barrantes a couple of years ago. Yesudas was ushered into the world of Hindi film music in 1975 by Salil Choudhury, himself a loyal admirer of the southern singer’s velvet voice. The film was ‘Choti Si Baat’ and the song Janeman Janeman Tere Do Nayan, a duet with Asha Bhosle. It was soon followed by Ni Sa Ga Ma Pa in ‘Anand Mahal’, a semi-classical number set to tune by Salilda. Yesudas had the entire nation hum those songs. 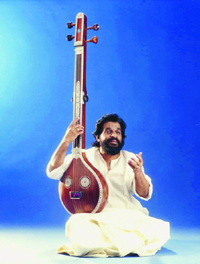 "I met Salilda way back in 1965, during the recording of Chemmeen, a landmark film in Malayalam," says Yesudas. "I still remember accompanying him to the Mumbai residence of Lata Mangeshkar once. Salilda wanted Lataji to sing one of the film’s songs. To our dismay, she was down with a fever, and eventually the song Kadalinakkare Ponore was recorded in my voice." The song Janeman pictured on Amol Palekar and Vidya Sinha in Choti Si Baat became an overnight rage, and Yesudas was flooded with offers from other composers as well. "I had a special bond with Ravindra Jain," recalls Yesudas. "It was Jain saab who gave me the maximum number of hits." The composer-singer duo rode on the wave of success from ‘Chitchor’ (Jab Deep Jale Aana, Tujo Mere Sur Mein, Gori Tera) to ‘Naiyya’ (Ho Goriya Re) to ‘Mere Rakshak’ (Tere Honthon Se) to ‘Sunayana’ (Ansoo Bhi Hain, Sunayana). Yesudas went on to sing for most of the leading composers of the day ranging from Usha Khanna to Rajkamal. His memorable songs include Kahan Se Aaye Badra, Tujhe Dekh Kar, Chand Jaise Mukhde Pe (Rajkamal), Madhuban Khushboo, Dil Ke Tukde Tukde (Usha Khanna), Ka Karoon Sajni (Swamy) Kise Khabar Kahan Dagar (Hemant Kumar), Maana Ho Tum, Gaao Mera Man, Dheere Dheere Subah Hui (Bappi Lahiri), Surmayee Akhiyon (Ilayaraja) and Tum Itni To Sundar Ho (Shyamal Mitra). 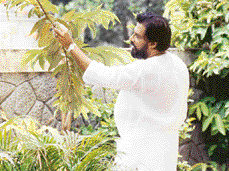 Yesudas’ Hindi diction had few admirers in Bollywood. The music lovers, however, could afford to overlook such flaws, as his voice and style of rendition were simply out of this world. Yesu’s strength has always been his keen sense of sruthi, and this has put him in the league of accomplished Hindustani singers. No wonder Ravindra Jain chose him to sing the complex classical numbers in Tansen, a film which never saw the light of day. "Yesudas is unparalleled when it comes to the rendition of classical numbers," says Jain. Adds Ilayaraja, the legendary Tamil composer: "I would rate him as second to Mohammed Rafi only, in sheer versatility." The late Jaidev was one composer who would vouch for that. His songs in Aalap were set to four different ragas — Koi Gaata Main So Jaata in ‘Behag’, Chand Akela in ‘Desh’, Zindagi Ko Sanwara Hoga in ‘Ahir Bhairav’, and Mata Saraswati in ‘Bhairavi’. The singer’s passion for music has been inherited by his second son Vijay, an upcoming singer. Vijay has a few hits to his credit. "I know it’s too hard to leave your mark on the music scene just by resting on your father’s laurels. I am indeed inspired by his commitment and dedication, but have never tried to copy him," says Vijay. "Diction had been a problem in the beginning," says the youngster who had his education in the US "But now I feel I have overcome this hurdle." Vijay made his entry recording a shloka for the film Idanazhiyil Oru Kalocha under veteran composer V Dakshinamoorthy, more than 15 years ago. Yesu’s eldest son Vinod handles the administration and business part of his Tarangini Audio Corporation, and his youngest son Vishal is studying in the US. Yesu shuttles between Fort Lauderdale, Florida, and Chennai. He has a house in Florida but spends most of his time in Chennai. I did it my way...."
A great devotee of Sri Ayyappan, Yesu makes it a habit to visit Sabarimala whenever he is in India during the`A0Makaravilakku season. Though a Krishna devotee, he has never been permitted to enter the famed Guruvayur temple, where non-Hindus are not allowed in. Interestingly most of the temples in Kerala open every morning listening to the devotional songs sung by him. "I had once felt bad about not being allowed inside Guruvayur. But now I have learnt to cope with it. I have realised that one need not worship God in temples to seek his blessings. by Yesu’s vocals and used in the film Othenante Makan. Chembai, Yesu’s guru and`A0a great devotee of Guruvayurappan,`A0was`A0sad that his shishya was not allowed inside`A0the temple.